Recently we had a special guest at Kaplan, Klaudia Halejcio, a 24 year old Polish actress, who studied English at our Covent Garden school in London for two weeks. Natalia Wiśniewska, the editor of our Polish blog, asked Klaudia about her impressions on her stay in London. Read the interview with Klaudia in Polish. Natalia, Kaplan: How did you feel before coming for an English course to London? Klaudia Halejcio: I’m always a little nervous before such trips, but it turned out to be for nothing. The staff at school, my classmates and people I met in my student residence (Urbanest), were amazing. All of them were very helpful and nice. What did you on your first day? On the first day, I had a placement test and the results were used to place me in the right lessons for my English level. How did you like London? The other place I loved was Camden Town. Lots of interesting people and cheap multinational cuisine. If you could stay here for longer, what would you like to see? During those 2 weeks I managed to see the most important things. If I had a chance to stay here longer, I would like to spend it in a less touristy part of London. I’d like to get to know London from scratch. Have you managed to get to know the rhythm of London? Yes, I’ve experienced it myself (laugh). Packed tube, crowded streets and a constant rush… I’ve had an impression that London never falls asleep. That was partly caused by the fact that my accommodation was next to a busy street, next to Tower Hill. Who was in your class? There were people from Venezuela, Thailand, Turkey, Albania, Spain, Italy and many more. We were a huge international mixture and we loved it! I’m leaving London with very good friends. What were your English lessons at Kaplan like? Completely different from a Polish school. First of all, I was forced to think and speak only in English. In my group there was not a single Polish person, so I just had to use English. I’ve improved my pronunciation and widened my vocabulary. My class started at 2pm, so if I felt like it, I could come earlier and participate in some additional classes. There are also interesting activities after class, for example musicals, visits to museums, etc. These are opportunities to practice your English in real life. Some people come to study at Kaplan for as long as a year, but you have spent only two weeks here. Have you improved your English anyway? Yes. Studying here is completely different than in Poland. First of all, the teachers are native speakers. They make it very easy to grasp the proper accent. They teach us useful, everyday vocabulary. The lessons are very engaging. There is a lot of interaction between the students and a lot of talking. We have an opportunity to use the new grammar rules and vocabulary straight away. I would recommend it to anyone who wants to improve his English in a short period of time. It’s definitely worth it. 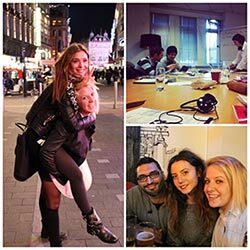 Are you interested in traveling to London like Klaudia? Kaplan has created the 8 Great Things to do in London motiongraphic, which shows the best things to do in the capital, according to our students. Click on the motiongraphic link to join the conversation.